The entire program and related programs on the same topics may be found at Pagan Media [that] Bites. I am writing on the matter of Prof. Jim Craven’s internet correspondence relating to the Tribunal on Indian Residential Schools held here in Vancouver, British Columbia, in June 98. Since the Tribunal, where I first met Prof. Craven, I have followed this matter with interest and have received much of the related E-mail material. With others, I have been assisting Prof. Craven to deal with the fraud and further victimization which has been taking place, both during and after the Tribunal. I very much respect Prof. Craven’s integrity, courage, dedication, and his considerable skills in handling extremely important and sensitive issues. As I live in Vancouver, B.C. and have connections here, both Indian and non-Indian, involved in the Indian rights struggle, I was able to make some connections for Prof. Craven. He has visited Vancouver B.C. several times since June to further investigate the matters he has been writing about and we have been in frequent communication. I myself am a trained human rights worker and trained social worker (MSW, McGill University) with over 30 years experience of cross-cultural family and social justice issues. I have worked in Asia for 10 years with International Social Service, a Geneva-based NGO, and worked for 10 years in British Columbia with NGO’s in the field of minority rights. Although Kevin Annett has gained media attention, being articulate and with dramatic stories, there is no doubt in my mind that he has been using survivors of the residential school system for his own purposes, and using their recorded testimonies to publish articles about them without their permission. I have seen enough untruths in Kevin Annett’s own E-Mail writings to indicate outright deception, or someone who is seriously out of reality. I have also seen evidence and heard reports of his controlling and domineering behavior towards Indians which is really another unacceptable form of abuse. I can also say, to the best of my knowledge of the Indian community in Vancouver, that he does not speak for any group nor does he have support from any organization or individuals since he has betrayed the trust which people had given him. In other words, he does not have credibility where it counts. Therefore, I believe Prof. Craven is doing a service to the Indian Residential School survivors in B.C. by his exposure of Annett’s doings. These people do not have access to E-Mail, many are not highly educated, and they lack the means to defend themselves when the matter enters the “high-tech” arena. It is to Prof. Craven’s credit that he has taken on this issue, following through on his responsibility as a Tribunal Judge. I believe his sense of outrage at what has been happening is entirely justified. We have seen examples before in British Columbia and in Canada of what is called “expropriation of voice” by white academics and consultants who get involved in Indian justice issues and end up taking over, usually for some personal gain either material or psychological. 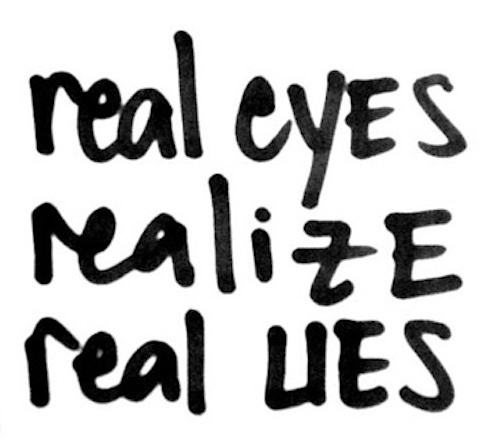 In any human rights or victim advocacy work it is a basic rule that the primary subjects, their perceptions and their privacy must be given utmost respect and one cannot take seriously anyone working in these matters who fails to do so. I therefore commend Prof. Craven for this important work, which very few people would be able or willing to take on. He is certainly an exceptional person. Through his efforts, the Residential School survivors habe been greatly encouraged to stand up for themselves and I understand they are now taking legal counsel to deal with Annett. Prof. Craven’s intervention has certainly been valuable and I know of people who are impressed. On the same matter as above I am also transmitting statements dictated to me by Kitty Bell Sparrow and by Harriet Nahane, both are unable to access fax or internet. 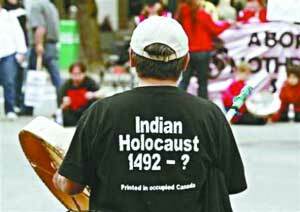 I have spent over 50 years in activism on behalf of Indian people in British Columbia, USA and internationally. I am the third generation in a family of pioneer activists which goes back to the last century, a time when Indians here had no rights. My father was Thomas Hurley, the first lawyer in B.C. to defend Indians in court, at a time when they were considered savages. From my father, mother and grandmother I have learned and been strictly taught that any non-Indian working with Indian people must not be in the forefront and must in all circumstances take direction from Indians themselves. Non-Indian people must listen and not formulate their own perspectives on behalf of Indians. I have always sought to adhere to these basic principles in all my work. I am the founder and was editor of Indian voice, an internationally known paper from 1967 to 1980, and I trained many Native journalists and writers. This paper covered the Leonard Peltier trials in depth, including the extradition hearings in Canada. For 25 years I have been the senior reporter to the Indian Homemakers Association which gave voice to Indian Women on reserves. I have acted as liaison to Indian prisoners for many years and assisted Deno Butler in gaining recognition for Indian spiritual practices in prisons in Canada. I am an elder of the Musqueum Nation through marriage to my late husband John Sparrow. Although I am now blind, I still receive calls and visits from Indian people from all over North America and I still attend and testify on many court cases here in B.C. on Indian rights issues. I had received information about the Tribunal on Indian Residential Schools from several persons and I had the opportunity to meet with Jim Craven on one of his visits to Vancouver B.C. He has consulted with me on matters related to the Tribunal. I know about the fraud which was carried out by persons involved with the Tribunal, including Kevin Annett. Unfortunately he fits the profile of so many others who seek to take advantage of the trust of Indian people, building their own careers on Indian’s suffering. If, in the Black Civil Rights Movement in the United States, a white person had presumed to speak for leaders such as Martin Luther King or Malcolm X, it would not have been acceptable to the black people. Indian people feel the same way here. I was Convener of the Tribunal on Residential Schools which took place in Vancouver B.C. in June of this year. I worked together with Kevin Annett whom I have been associated with for several years. As a Residential School survivor this Tribunal was very important to me. It was my hope that some justice could be won for our people. There is a federal government Healing Fund of $350 million for healing of survivors but none of it has gone to the survivors themselves. I put a lot of effort into the preparation of the Tribunal and it was through my relationship with Jack Bell, a wealthy Benefactor, that the Tribunal was able to secure special terms for the rental of the hall at the Maritime Labor Centre. 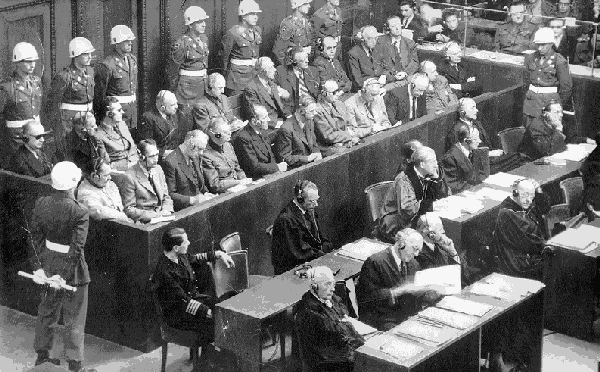 During the Tribunal a number of things went seriously wrong. Decisions and procedures which had been decided together were suddenly changed without my participation, funds were misappropriated, the privacy of witnesses giving closed testimony was compromised, and some of the judges appointed by Kevin Annett and Rudy James turned out to be without credentials. Many people were upset and angry. Jim Craven saw what was going on and has attempted to set things right. I have serious grievances with Kevin Annett because of his actions during and after the Tribunal which showed that he had an agenda other than that which had been presented at first. I feel used by him and information about my experiences at residential school have been given for publication by him without my consent. I am President of the Western Canada Leonard Peltier Defence Fund and District Vice-President of the Indian Homemakers Association in North Vancouver. I belong to the Pacheeda Nation and carry the name of Tsibeot who was the Grand chief of Pacheeda. I also run the Sacred Duty Institute and I teach hereditary chiefs their traditional roles. I feel very strongly that nobody has the right to speak for others but white people always speak for us and think they know better than us. They consider us as helpless children to work on behalf of. Most of us who survived the Residential Schools and have been involved in court cases in Port Alberni suing the United Church and the government of Canada, we are not on the internet. Jim Craven has taken a lot of trouble to inform us about these discussions on internet, to listen to us carefuly and speak our thoughts the way we would like. We would like him to continue. If you need further information on any of these matters please contact me by phone at (604) 985-5817. Hope this may be of help for whatever! I am taking care to be specific, but not too much. If there are any changes to be made, let me know. Keep after them. Love to the family – Diane & Tatsuo. I am an old friend and colleague of Harriet Nahanee and Jim Craven and I have worked with both of them on various matters over the years concerning Indian rights and justice issues. Harriet died on Feb.24 of this year after becoming seriously ill in prison. 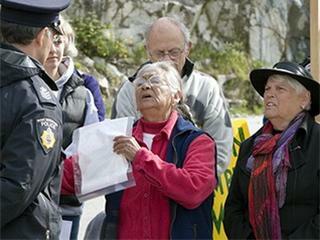 She was incarcerated on Jan. 29, 2007 by the Supreme Court of British Columbia for joining a road block to protect her traditional Squamish territory from industrial destruction. I attended her funeral on Feb.28 together with Jim Craven, her friend and confidant of many years. Prof. Craven made a special trip from Vancouver, Washington, upon hearing of her death. A year previously, together with other friends, Harriet had attended Prof. Craven’s wedding party held at my home in Vancouver, B.C. Harriet performed a traditional ceremony for the couple and also brought home-cooked food and a gift for the occasion. A few months later in the summer of 2006 Prof Craven invited a hereditary chief of the Blackfoot Nation with his wife to meet with him at my home. They were close associates and had come to attend a Conference in Vancouver, B.C. on Indian rights. Harriet Nahanee, also a hereditary chief, joined them to work on common issues. Several years previously, Harriet had sheltered a Blackfoot woman in her home for several months. A close associate of Jim Craven, this woman was fleeing persecution and needed a place to stay while arranging for legal assistance. Harriet, Prof. Craven and myself worked together to assist her and her children. These are a few examples I recall which clearly illustrate the on-going relationship of friendship and trust between Harriet Nahanee and Prof. Jim Craven and continued until Harriet’s death. This entry was posted in 4th Media, Aboriginal Law, Academia and Academics, Canadian and American Holocausts, Canadian Genocide, Eugenics Movement, Fascism in America, First Nations in Canada, Genocide in and From America, Indigenous Issues, Indigenous Science, International Law and Nuremberg Precedents, Legal Actions on Genocide, Mainstream Media (MSM) Shills, Political Economy, Psychopaths and Sociopaths in Politics, Rockefellers and Nazi Eugenics, U.S. Terrorism, Uncategorized and tagged A-political Intellectuals, Cover-ups, cults, Eugenics, Fascism, Genocide, hidden history, Holocaust, Imperialism, Indigenous, Indigenous Science, Media Cover-up, Missionaries, Secret History, Social Systems Engineering, Terrorism, theology, War, War Crimes. Bookmark the permalink. Professor Craven is known across the Indian world as a tireless and honest worker for Indian people who are in need. It is his duty to help and advise all native students.We are hoping that Professor Craven will be allowed to continue hes work for aboriginal justice and that it will not be in any way a detriment to his professional employment. All people must understand the agony and suffering that the residential schools have inflicted on the native peoples and only through enlightened and sympathetic support can the abuse stop.